This is the most important tool in your Razertip tool kit. Keeping your tips clean of carbon buildup will keep your pens working for years. Carbon buildup means the heat will not transfer from your pen to your gourds. You’ll push harder, turn up the heat, thinking that will work. 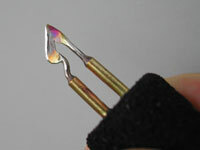 In fact, you’ll only be weakening the metal tip and will end up bending and ultimately breaking the tip. It’s so much easier to just use the Razertip cleaner to scrape off the carbon buildup every few minutes so that your pen can have the long life it was designed to give you. 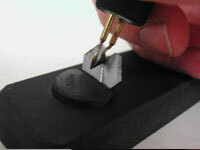 (1) Carbon has begun building up along the cutting edge of the tip of the Razertip pen. Notice the black area along the leading edge of the tip in the upper left middle of the photograph. (2) Pull the edge of the tip toward you and against the edge of the crossed knife blades, which are inserted into the block of the tip cleaner to clean the carbon off one side of the blade edge. (3) Then pull the other edge of the tip toward you and against the outside edge of the crossed knife to clean the carbon off the other side of the blade edge. 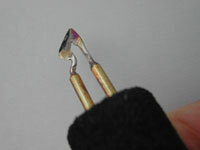 (4) Here is the same tip after removing the carbon. 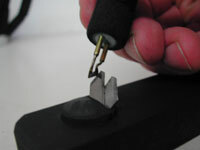 No sharpening is necessary if care is taken to remove the carbon before it builds up.